Utagawa Kuniyoshi (1797-1861) The Sixty-nine Stations of the Kisokaido Road #4: Urawa, 1852. Oban. Here of course is the famous Danshichi. The picture is from the great woodblock print series by Kuniyoshi of the stations of the Kisokaido Road, another attempt to stymie the authorities and their prohibition on ‘decadent’ actor portraits, by pretending they are illustrations to travel pictures! The plot of the hapless and popular Danshichi derives from a real event of 1744. The murder story was wildly popular as a kabuki play and it was staged in a dramatic manner with the actor washing the blood off his body with real water. Danshichi vows to protect the lover of his young friend Isonojo, from the attentions of a lustful samurai. Danshichi’s greedy father in law, Giheiji, tries to sell the girl, Kotoura to the old man and is stopped by Danshichi who kills him in the fray. 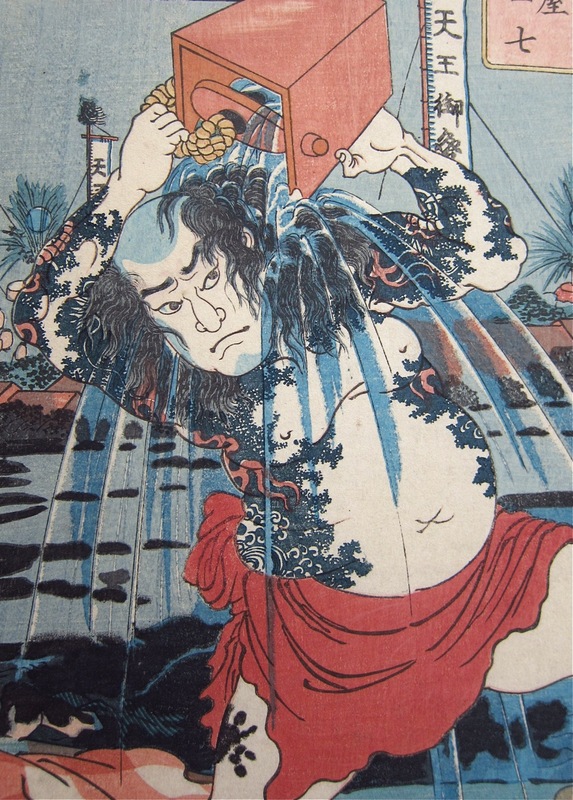 In the background is a riotous summer festival and after washing himself down and burying the body, Danshichi makes good his escape. His distinctive red cape is shown at his feet and is echoed in the framing of the landscape in the upper left. 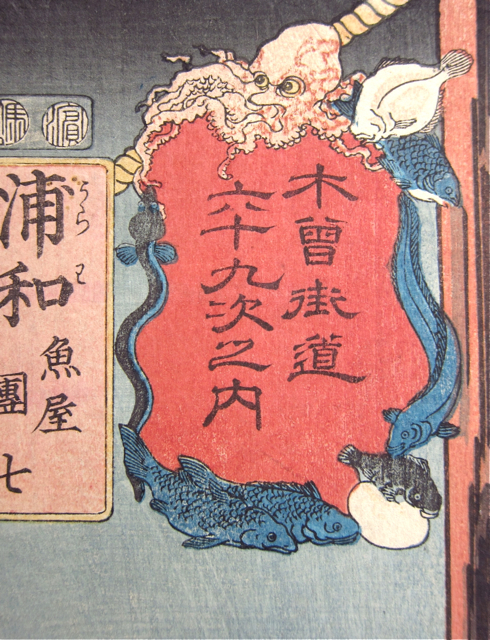 The cartouche in the upper right has a charming, human like octopus or cuttlefish which alludes to Danshichi’s trade as a fish merchant. Kuniyoshi was very fond of the octopus and illustrates the creature with a 'human' face. 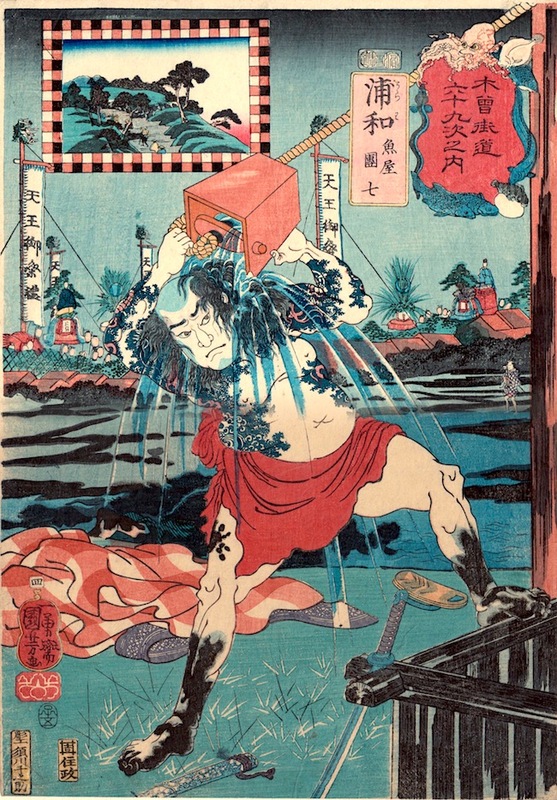 The pose Danshichi adopts here is constantly used as typical of the character. It is a comprehensive retelling… the festival banners are seen in the background, the murder weapon is propped against a crate in the foreground, muddy and bloody handprints of the victim cover his body. This is one of the best prints from the series. We are in the very middle of the nineteenth century, a decade before the Meiji Revolution that Kuniyoshi might have anticipated but not witnessed. Here, at the height of the popularity of the woodblock print genre, is all of the confidence of an art form at its very peak. We are looking back here to the archaic and tactile prints of the early part of the century and forward to the demise of the genre and the relentless march of innovation. Colour and impression fine, condition overall is very good.